During the month of June, visitors to the Lower Don Valley came across an unexpected scene in a field just north of the Bloor Viaduct: two mini donkeys and a red and white wooden shelter. 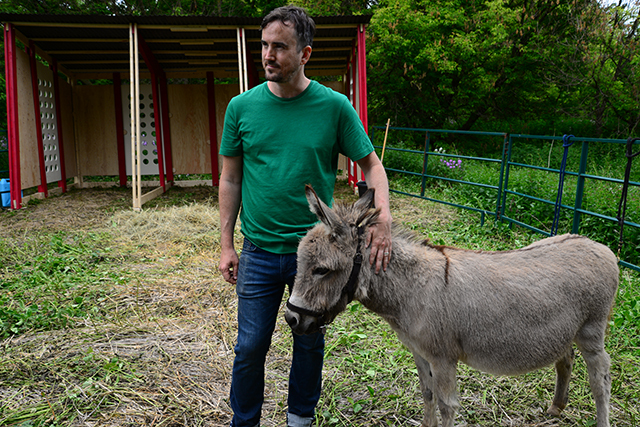 Toronto artist Gareth Long presented Travels with Two Donkeys in the Valley, the latest project in the Don River Valley Park Art Program. 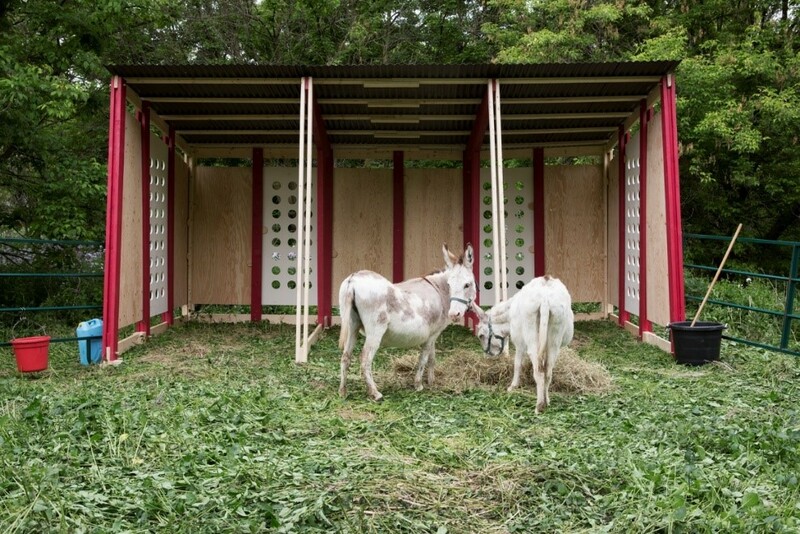 In partnership with the Donkey Sanctuary of Canada, the donkeys spent each Saturday in a shelter designed by Long and architect friend Christian Kliegel. 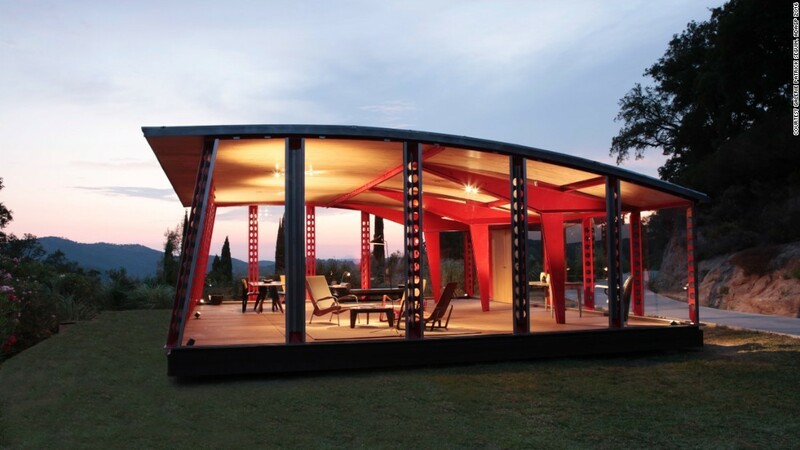 The piece was inspired by mid twentieth-century French designer Jean Prouvé and his modular schoolhouse. Prouvé’s temporary architecture was produced as a solution to the housing crises of his day and espouse an underlying social and political consciousness in how they were designed and built. Long extends these principles to present-day Toronto, building the structure using materials that resonate with both the past and present of the Don Valley and the vernacular materials of the farm. Long was interested in Prouvé’s 1949 design of a portable schoolhouse for French students. The school house is considered a site of education and conversation, which according to Long, speaks directly to the essence of this project. Donkeys often symbolize stupidity and ignorance in art and literature, and housing donkeys in a structure that mimics Prouvé’s schoolhouse is a reversal this notion. Throughout the project, Long developed a close relationship with the Donkey Sanctuary of Canada and wanted to design a structure that could be donated to them once the project was completed. It was integral that the structure was designed in a way that put donkeys first. Artist Gareth Long with one of the donkeys. Photo by: Don Long. Many of the obstacles that existed in creating a structure in the Don Valley were tackled by Prouvé’s approach to building: temporary in nature, small-scale, simple materials and relatively quick assembly and disassembly. Flooding of the Don Valley, a natural and occasional occurrence, posed a risk to any structure that would be brought in or built as part of this project. Because of this, it was important that the donkey structure was temporary and easy to put up and take down each Saturday. Easy-to-move plywood was used for the walls of the structure, held together by wooden dowels and hammered using rubber mallets. Some screws were used for stability, and the roof was lightweight corrugated metal sheets. Spaced holes were cut out of a few of the walls, creating an interesting combination of ventilation and aesthetic. Experts from the Donkey Sanctuary of Canada said that having a structure allows the donkeys to feel safe and secure in the middle of an open field, while the holes in the walls let the donkeys curiously peak out for a 360-degree view of their surroundings. Installation of the structure took about three hours each morning, and the same to disassemble in the evening. For Long and his team of installers, this was a fairly quick and easy process, especially by the fourth Saturday. All the different elements were unloaded from a truck, and sorted into piles of like-pieces, similar to sorting pieces of a jigsaw puzzle. Like a well-oiled machine, the team then started by assembling the walls. Long had done a few “practice runs” of this installation to ensure he understood which pieces should be raised in which order. Minimal tools were needed as many pieces fit together with wooden dowel and tongue and groove, meaning that heavy-duty construction was not required. This was important, not only for the installation team, but also to ensure there were no large adverse impacts on the environment of the Valley. Donkeys and the structure on event day. Photo by: Claire Harvey. Once the project was complete, the structure was dismantled in the Valley for the last time. Now, it’s off to its permanent home at the Donkey Sanctuary of Canada, located in Puslinch, Ontario. Read more about this project at Frieze.com.